WHEN I heard Mohammed Iqbal’s Sare Jahan se Achha.. on the radio, it was in the early 1940s and I was a student in Amritsar. This song was sung many a times in our school assembly. The song took my thought to the writer. It was but a short step to wonder about the metamorphosis that took place in his life and outlook. He took a complete U-turn, from being a poet of a nationalist hue, a votary of the composite culture of India, to becoming a poet of Islam only. Such turnarounds are always fascinating to study. Allama Iqbal was a great poet, perhaps the greatest Urdu poet of his time. He broke new ground in covering a much larger ground in his poems compared to the earlier great poets of the nineteenth century. He had a rare control over written Urdu. His career as a poet can be divided into three phases. His first phase as poet started when he was 20, in 1897-98, when burst upon the Urdu literary scene like a comet. During the next six years or so he was nationalist in his outlook and idealist in his poetry. It was rare for one so young, before he was even 30, to become so famous, and so deservedly. It was upon his writings during this brief period that his reputation as a poet survives in India, and also in Pakistan. But that was the first, youthful idealist phase of his life when he wrote verse full of idealism. He wrote of Ram as the Prophet of Hind. He also wrote, Mazhab nahi sikhaataa aapas mein bair rakhana (religion does not teach us mutual animosity.) Iqbal of that time also used to stress his descent from the line of Hindu Kashmiri Pandits. That idealistic phase lasted till 1905. The turning point came with his three years’ sojourn in England and Germany where he went in 1905 for higher studies. After returning to India in 1908 he never wrote anything which could even be remotely construed as nationalist in sentiment. His second phase started with two major philosophic poems, Shikwa (in 1911) and Jawa-be- Shikwa (in 1912) both of which were masterpieces. It was the phase as a Muslim poet. In the first poem he, as a Muslim, makes complaint to God about the pitiable condition of Muslims. In the second, the God replies to the complaint. 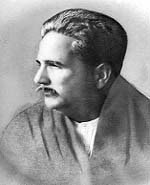 As Iqbal advanced in age and his commitment to the Islamic cause deepened, his partiality for a common composite culture receded. Only his Islamic identity became important to him. His metamorphosis was so complete that instead of his earlier evocation Hindi hain hum, vatan hai Hindostan hamara, (We are Indian and India is our motherland,) he now wrote Muslim hain hum, vatan hai sara jahan hamara, (We are Muslims and the entire world belongs to us.) Instead of the other non-Muslim Indians now non-Indian Muslims, the Arabs and the Persians became his new brethren, merely because they were Muslims. He even forgot his Kashmiri Pandit ancestry. Iqbal’s third phase as a poet started when, under some mistaken belief, he started writing in sterile, fossilised Persian instead of lively Urdu. The Persian-knowing Indians, who learn Persian from hundred years’ old traditions, had not kept up with the living Persian language of Iran. It is tragic that those great works of Iqbal have remained beyond the reach of common Indians, Muslims included. And they are hardly noticed in Iran for being written in a quaint, fossilised language. It was a case of falling between the two stools.